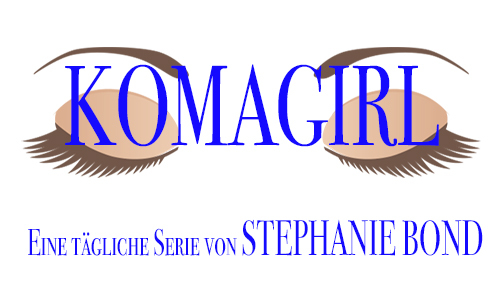 KOMAGIRL – ein kostenloser täglicher Fortsetzungsroman Ab 1. Juli ! lt ins Internet gestellt um möglichst vielen Lesern den Start zu ermöglichen. Sagt Euren Freunden Bescheid ! Ab 11. Juli sind dann die täglichen Episoden nur für 24 Stunden verfügbar. Also Merker setzen auf Deinem Handy, Computer oder Memo-board um täglich kostenlos bei Komagirl auf dem Laufenden zu bleiben. Verpasse keinen einzigen Tag von Komagirl ab 1. Juli ! A new German book release! 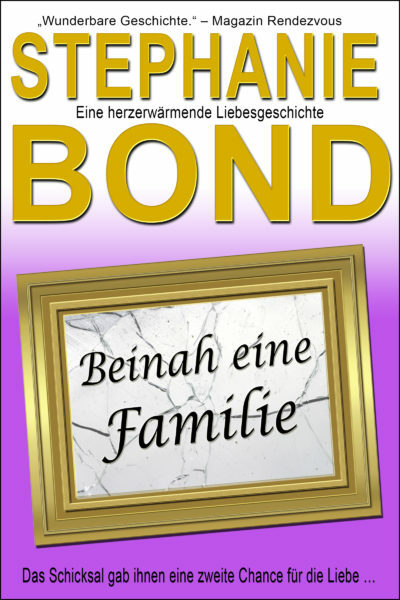 I’m happy to announce the release of BEINAH EINE FAMILIE, the German language version of ALMOST A FAMILY, now available in ebook at all online retailers, and in print from Amazon! Danke sehr! A *FREE* COMA GIRL coloring sheet! And a contest. With a prize. Coloring is all the craze! Enthusiasts say it’s fun and even therapeutic. Have you tried it? Are you good at it?! 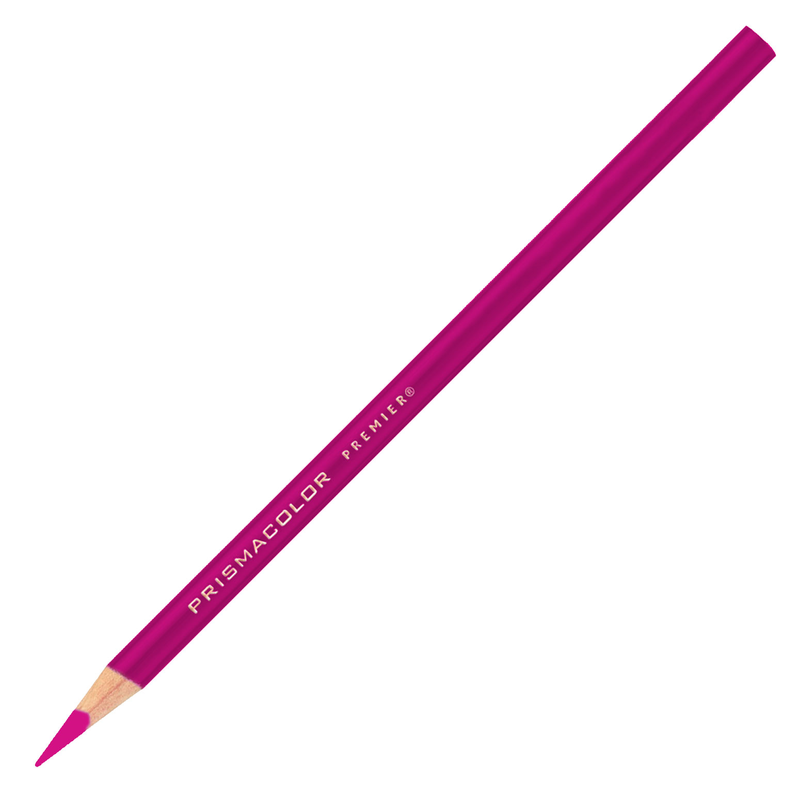 Or maybe you’ve always wanted to experiment with coloring? If so, this contest is for you! If you’ve been following the COMA GIRL daily serial, you know that one of the few brights spots is when Marigold’s sister brings scarves to cover her head bandages. 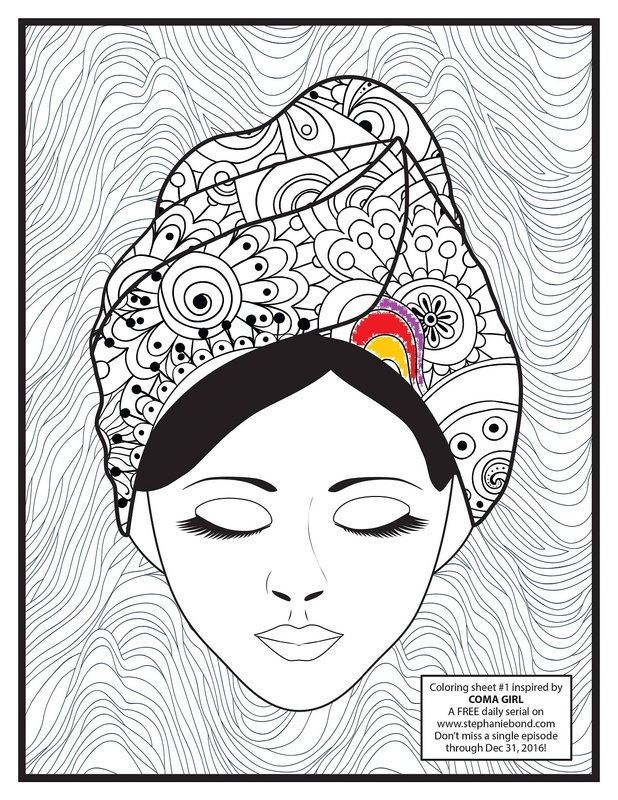 This coloring sheet celebrates that bit of color in COMA GIRL’s life. What equipment will you need to enter the coloring contest? Colored pencils, crayons, markers, etc. Click here to print your own COMA GIRL coloring sheet and get contest info–you might win a $50 Amazon gift card! Of course you can print a coloring sheet and create your masterpiece in private–you don’t HAVE to enter the contest…but I hope you do! Even if you don’t enter, please do click over and see what other readers have uploaded to the contest page and vote for your favorites! NEW! 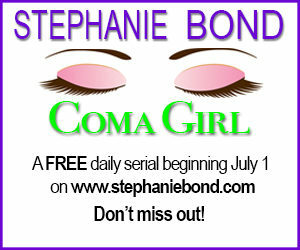 Don’t miss out on the free COMA GIRL daily serial! I’m so excited to share news of a new project! COMA GIRL is a new daily serial beginning Friday, July 1 right here on my website. In COMA GIRL, a victim of a tragic event lies in a hospital bed, at the mercy of friends and relatives who think she can’t hear them. Click here to read the introduction to COMA GIRL, and be sure to set a reminder to come back every day for the latest segment! NEW BOOK! 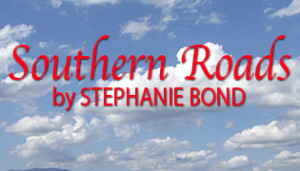 Baby, It’s You novella is latest installment in the Southern Roads series! I’m happy to announce the release of BABY, IT’S YOU, the newest installment in the Southern Roads series! In BABY, IT’S YOU, Dr. Jay Cross is worried things are getting serious between Rachel Hutchins and Barry Devine, and decides if he’s going to land the brainy beauty, he’s going to have to up his game. So Jay approaches the three Armstrong brothers, all of them strapping ex-military men, and asks them to make him over from a small-framed British intellect into an alpha male Southern boy who will get Rachel’s attention. The brothers agree and are determined to make a Southern man out of him, but will all the sweat and humiliation be a waste of time? 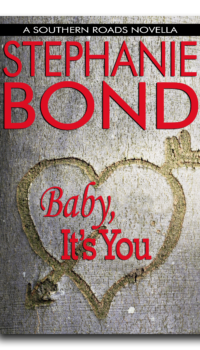 For more information on BABY, IT’S YOU, including links to order, click here. For more information on this romance series, click here for the FAQs page. I hope you’re enjoying the Southern Roads series! There is some interest in turning it into a TV series, so fingers crossed! SAVE THE DATE! The Hallmark Channel movie of STOP THE WEDDING! airs Sat., June 11 at 9pm eastern! I’m so excited to announce the airdate of the STOP THE WEDDING! movie: Saturday, June 11 at 9pm e/8c on the Hallmark Channel! The movie stars Rachel Boston, Niall Matter (both of whom are pictured on the special movie tie-in cover below), Alan Thicke, Teryl Rothery, Lini Evans, and many more wonderful actors! (For a peek at the full cast, click here to check out the InternetMovieDataBase page for STOP THE WEDDING!) My man y thanks to the producers of the movie, and to the screenwriter, Nina Weinman, for bringing my story to life. There’s a lot of work in taking a novel and adding visual elements and set pieces to make it suitable for a 2-hour movie. This book was probably the most unlikely story ever to make it to the movie stage. 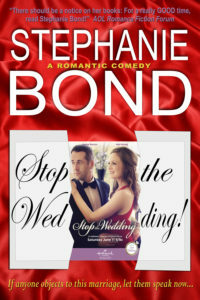 I wrote STOP THE WEDDING! almost 20 years ago for an editor in the UK who was looking to add comedy to the line of books she oversaw. She liked the concept of STW, but she said she’d need a full manuscript to show to her boss before she could make me an offer. In the writing world, we call that writing a project on the speculation of selling or “on spec.” In other words, the author is taking ALL the risk because he/she might write it and then no one will buy it. Still, it was a risk I was willing to take, so I agreed to write the book on spec in between other projects I had contracted. But wouldn’t you know it–by the time I’d finished writing it a few months later, the editor had left the publisher! And her boss declined to even read my manuscript. I offered the manuscript to another editor I was writing for, but she turned it down, also unread. I think in total, it was turned down six or seven times by different editors, each time unread. So I eventually forgot about it. Fast forward to 2012 when I was having some success self-publishing. 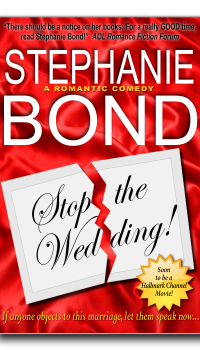 I remembered STOP THE WEDDING!, but I didn’t have a printed copy and I didn’t know where the computer files were anymore. I finally found a 3.5″ diskette languishing in the back of a dusty desk drawer labeled STW. Only I didn’t know if the files were still on there (in those days, diskettes failed pretty often) and I no longer had a computer with a diskette drive. So I sent it off to a service that would transfer the info to a CD–that took a few weeks. When I got it back, I inserted the CD into my laptop and held my breath….and the files were there! And then, the real test–had the story held up over time? I read it through and although it needed some updating (pagers and boom boxes ruled), I still loved the story and the characters. So I polished and revamped it and self-published it with a gorgeous cover (by Andrew Brown at Click Twice Design) and hoped for the best. And the little book that could soon became a bestseller (#2 on the overall Kindle list), and went on to become my bestselling book of all time. Isn’t that the way of things?! A few months later, I received an email through my website from a producer who had read the book and thought it would make a great movie. I told her my mother totally agreed, and connected her with my agent. Two short years later (yes, that’s how the film industry works! ), the book was optioned for development as a Hallmark movie. And now, I can scarcely believe it’s about to air! 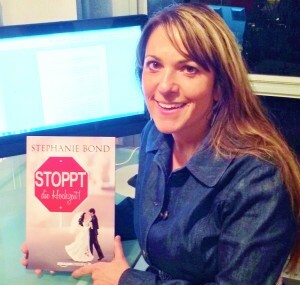 I hope you will help me to get the word out about the STOP THE WEDDING! movie on the Hallmark Channel. And I hope you’ll tune in if you have time and are into that whole happiness thing. 🙂 I haven’t seen the movie yet, so I’ll be watching right along with you! Meanwhile, here’s a link to the trailer…I hope you enjoy! 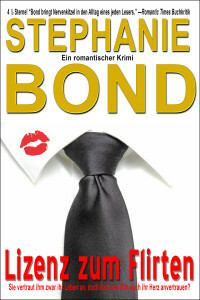 I’m happy to announce the release of LIZENZ ZUM FLIRTEN, the German language version of LICENSE TO THRILL, now available in ebook at all online retailers, and in print from Amazon! Danke sehr! Wanted: YOUR stories for Southern Roads! I’m happy to announce I recently licensed my romance series SOUTHERN ROADS to Amazon for their Kindle Worlds fan fiction program. (This is the second world I’ve licensed; my BODY MOVERS mystery series is also a Kindle World.) What is fan fiction? Fan fiction is when readers and writers “borrow” someone else’s characters and create their own stories in that world. Some of you might know that 50 Shades of Grey by EL James was originally written as fan fiction in the world of the Twilight saga written by Stephenie Meyer. When the piece of fan fiction became wildly popular, James changed the character names and tweaked it enough to release the story on its own…and the rest is history. Up til now, fan fiction has mostly been an underground exchange of works on forums and pop-up websites because, in truth, fan fiction violates the original author’s copyright. Amazon’s Kindle Worlds is attempting to bring fan fiction to the forefront, however, by licensing the worlds from the author. In essence, Kindle Worlds is author-sanctioned fan fiction–authors are giving others permission to take their copyrighted characters and run with them in directions the original author might never consider! By opening SOUTHERN ROADS up to Kindle Worlds, I’m hoping readers and writers at all levels will do just that–write stories in the world I created that will entertain my readers–and entertain me! To recap, in the SOUTHERN ROADS series, three brothers decide to rebuild their hometown of Sweetness in the remote Georgia mountains that was wiped off the map ten years ago by a tornado. With an army of men they recruit, things are going well…until the men threaten mutiny because there are no women! So the brothers advertise for “100 women with a pioneering spirit” to come and help them build the town…and wow, do they come! Between the town being rebuilt and all the matchmaking going on, there are more stories in Sweetness than I could ever tell…and that’s where YOU come in! Write a story in the SOUTHERN ROADS Kindle World and not only do you get to try your hand at writing in an established world, but you earn royalties for every copy of your story that sells! I should also add there is no expense involved–you can even use a wizard to create your own cover for free. Intrigued? Click here to find out more information about writing for either (or both!) of my Kindle Worlds. Happy writing! Introducing my first book on writing! A book 20 years in the making! Early in my career I wrote articles for my local writing chapter newsletter. After I became published I gave workshops on craft, the writing life, and the business of writing. For five years I wrote a blog about writing. My friends have been bugging me for years to put all those bits and pieces together, and wow, it was harder than I thought it would be. (Seriously, I used this book to help me finish this book!) The problem was how to present all those nuggets of advice in digestible bites that would accumulate in a meaningful way into a manual on writing a novel….yet would still be motivational and a refresher for writers at all levels. 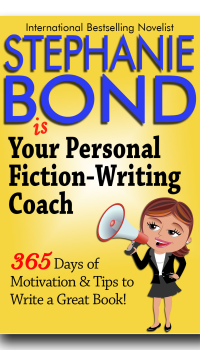 Personally, I need a little dose of inspiration every day, so I came up with Your Personal Fiction-Writing Coach: 365 Days of Motivation & Tips to Write a Great Book! The idea is to give you a year’s worth of encouragement and information, to consume either in one sitting, or a little at time, whatever pace works best for you! I think everyone has a book in them. If YOU have ever thought about writing a novel, I hope you’ll download a sample to see if you think this book would be helpful. Makes a good gift, too, if you know someone who needs a nudge to get their novel underway or finished! Happy writing, all! PDF files! To download and/or print the Imagination Drills from Your Personal Fiction-Writing Coach, click here! I’m writing like a fiend to finish a half dozen projects, but taking a quick break to let my German readers know Ich glaub, ich lieb dich! is in the Kindle Weekly Deal on Amazon.de thru August 13! STOP THE WEDDING! to be a Hallmark Channel movie! At the end of my romantic comedy STOP THE WEDDING! in my From the Author note, I mention that I’d love to see STW! as a movie someday. And it’s happening: STOP THE WEDDING! is in development for a movie on the Hallmark Channel! I’m so, so pleased….especially considering the history of this book. Seventeen years ago, an editor asked me to write a romantic comedy for her “line,” which at that time, was known for more serious stories. I pitched her the concept for STOP THE WEDDING! and she liked it, but said in order to convince her senior editor, she’d need to see the completed manuscript. I agreed, but warned her it would be a few months while I finished writing books I already had under contract. A few months later when STW! was finished, I learned she’d left the company…and her senior editor wasn’t interested in even reading the manuscript. So I offered it to another editor I was working with, but she turned it down, too, also unread. Over the next decade or so, any time an editor asked me for more material, I offered up STW!, but it was always rejected, always unread. I believe it was rejected 7 times. Fast forward to 2012 when the books I’d revamped and republished on my own the previous year were selling well. I remembered STOP THE WEDDING! and wondered if it was salvageable….but first I had to find the files! I finally located them on a dusty 3 1/2″ diskette languishing in a desk drawer. The problem was I no longer had a computer with a drive that would read the diskette. I sent it off to a service to have the files transferred to a CD, not knowing if the files were even readable. When I got the CD, I put it in my computer and held my breath…and the files were still intact! The next test was to see if the story still held up after all that time…and it had. It needed to be updated, of course, but I still liked the characters and the plot. So I polished it and published it on my own, with no great expectations. I credit a lot of those sales to the great cover designed by Andrew Brown of Click Twice Design. He “gets” the way I like my covers–simple, clean and bright. And even though editors didn’t fall in love with the concept, readers seemed to embrace the idea of a man and woman determined to stop their parents from getting married wind up falling in love with each other. It’s a light, fun romantic comedy meant to entertain–and I assume (hope) the people at Hallmark agreed! I’ll keep you posted on an airdate. I’m SO excited to see who is cast as Belle and Martin, Annabelle and Clay. After its bumpy, circuitous route to publication, I refer to STOP THE WEDDING! as The Little Book That Could. The book business is a rollercoaster–you never know what’s around the corner. But I’m hands-up for the ride! 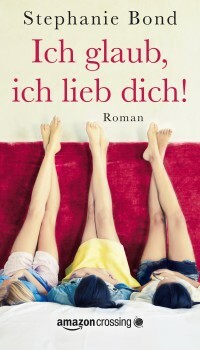 I THINK I LOVE YOU available in German! My humorous romantic mystery I THINK I LOVE YOU is now available in German! In I THINK I LOVE YOU (Ich glaub, ich lieb dich! ), three estranged sisters reunite to help their mother through a difficult time, but things quickly go sideways when the man all the sisters were once in love with puts in an appearance! Buy the German version from Amazon.com or from Amazon.de. 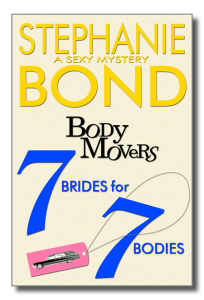 7 BRIDES FOR 7 BODIES now available in audio! 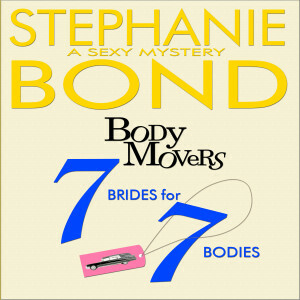 If you’re an audiobook lover, the latest installment in the Body Movers series, 7 BRIDES FOR 7 BODIES is now available in audio! Narrated by the amazing Maureen Jones. THREE WISHES available in French! 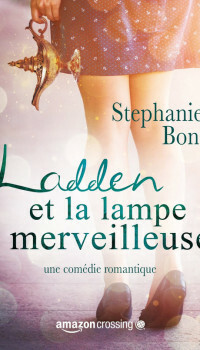 My romantic comedy THREE WISHES is now available in French! In THREE WISHES (Ladden et la lampe merveilleuse), an antiques dealer who’s in love with the governor’s girlfriend unwittingly releases a genie from a lamp and wishes himself into a hole the size of the Grand Canyon! Apparently, the French like themselves a little magic, too. Buy the French version from Amazon.com or from Amazon.fr. Thank you to Amazon Crossing! I just got this great metal plaque of the cover of my book STOP THE WEDDING! in German from my Amazon Crossing team! (This is me at my desk in my home office.) STOP THE WEDDING! (Stoppt die Hochzeit!) hit the Kindle bestseller list in Germany. 7 BRIDES FOR 7 BODIES available now! 7 BRIDES FOR 7 BODIES has been a long time in the making, and represents a milestone for me personally. Back when I was writing book 6 for my publisher, my editor warned me that in-house support for the series was waning, and I might be given only one more book to wrap up the series. That necessitated an escalation in the story arc–if I only had one more book to explain everything, then I needed for (spoiler alert if you haven’t read book 6!) Carlotta and Wesley’s father to return at the end. I’d wanted them to have time to look into their father’s case before he returned, but my hand was forced. Then–surprise! My publisher didn’t give me one more book to finish the series–they dropped the series altogether. I went on to write a romance series for them–the mortgage kind of needed to be paid. But readers were understandably upset that the BODY MOVERS series had ended on a cliffhanger. That was 2009 and I had no options for finishing the series–no publisher wants to pick up a series that another publisher has dropped and still controls the early books. Then in 2011 I launched a self-publishing venture to get some early titles back out there, and finishing the BODY MOVERS series on my own was suddenly a possibility. But I was in a bind, so to speak: my publisher still held the rights and control of the first 6 books for which they’d demonstrated disregard; for an author, that’s a dangerous place to operate from. I asked for the rights back to the first 6 books and was refused. I offered to buy the rights back–still no. Which left me in a dilemma: The only way I was ever going to get the rights back to books 1-6 was if the sales for those books dipped below a certain threshold. If I continued to write books in the series, I would be driving sales back to those early books, which would virtually guarantee I’d never get the rights back. What to do? I decided to keep writing books in the BODY MOVERS series. But while all the above was going on, I had set other projects in motion, which I had to finish. And business was booming–suddenly it was necessary to get my self-published books in other formats and languages, and that was all on me. Months passed while I got other pieces of business put in place, then (gulp!) years. Here’s where I should say that my former publisher, even though they haven’t reverted the ebook rights for the BODY MOVERS series, has since demonstrated a willingness to work with me on other aspects of the BODY MOVERS series, including helping me to get the out-of-print books available in print once again. The situation isn’t ideal, but it’s a working compromise. December 16, 2014— IN HINDSIGHT, my entire life has been about reinvention…and usually out of necessity! Back in the mid 90s, I relocated and left a job in computer programming I loved…and unfortunately, landed in a job I didn’t love. That move forced me to get serious about writing (a hobby up to that point), which led to a new career. I left the corporate world in the late 90s to write fiction full-time. Over the next 15 years or so, I wrote dozens of books for various NY publishers, with varying degrees of success and frustration. In 2011 when the economy and the book industry was floundering, my publisher withdrew support, and I wasn’t sure what to do next. With nothing to lose, I launched an independent publishing venture to put a dozen early titles of mine back out into the market…and the ebook market exploded in all directions! One day I was a middling novelist with an uncertain future…and the next day I was running an international multimedia company out of my tiny home office. It’s been mind-blowing in the best possible way!